and a high of 15 today we're ready for some cozy nights by our fireplace. and greenery (door swags I had). 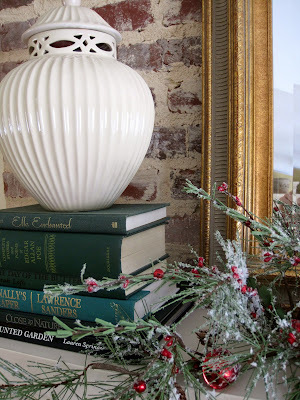 then I stole this large piece from a vignette in the kitchen - it works! all picked up at thrift stores. because you come visit everyday, I have a little surprise for you! Spot a mistake in the photo above and be the first to name it in a comment. I love games like this, being detailed and all I think I'm so good! Or, if yours is all decked out too, come join in! Pam is the glass broken on the glass vase? I am not a detail gal like you...now the curiosity is killing me! Your so naughty, does Santa know you tease us readers? HAHA! 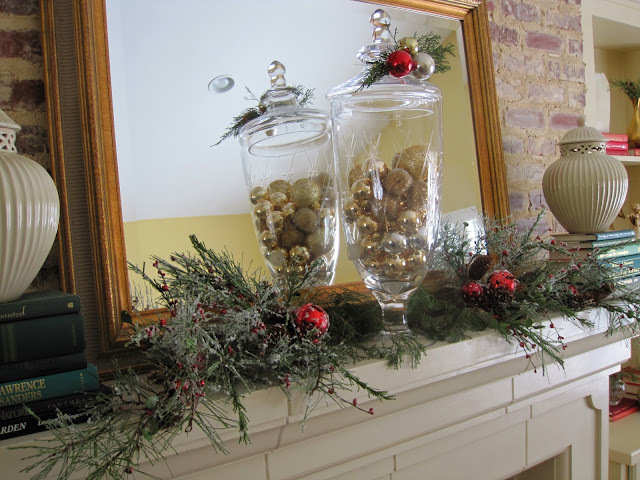 Love the mantel!! You did a great job in it, thanks for sharing! Ah, it's driving me crazy! Everything looks perfect! If I had to guess, is there 1 silver ball mixed in with the gold? Can't tell if that's just the lighting or if it's different! Looks beautiful girl! My eyes officially hurt. 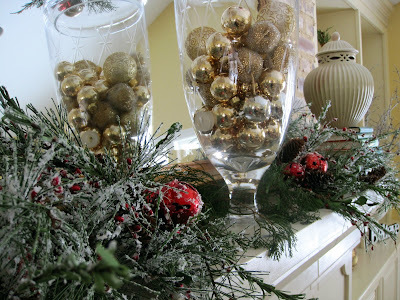 The only mildly sticking out item to me is in the bottom left of the mix of ornaments. One looks white and flat--did it break when you put them in? Looks wonderful! I need to find a thrift store. You're making me want to spray paint like crazy! Love your mantel. It bears your signature-simple elegance. You've got me stumped and I'm a "Where's Waldo?" Champ! Is one pot higher than the other, or is it just the photo? You can come make your lovely "mistakes" at my house anytime! There is a little tealight in the glass vase ;) But I'm just wierd like that. Everything looks gorgeous!! Very classic and chic. Merry Christmas. Ah man, I'm late in the game. Who knew you were such a tease?! ha! Hope you're party is a blast tonight. Can't wait to about it. We're all expecting a post! So simple and lovely, you are sticking to it girl! I think my eyes are too old to find the mistake but I think someone else did! How was your girlfriend party? Keep guessing - no winner yet! Everything looks perfect, Pam! 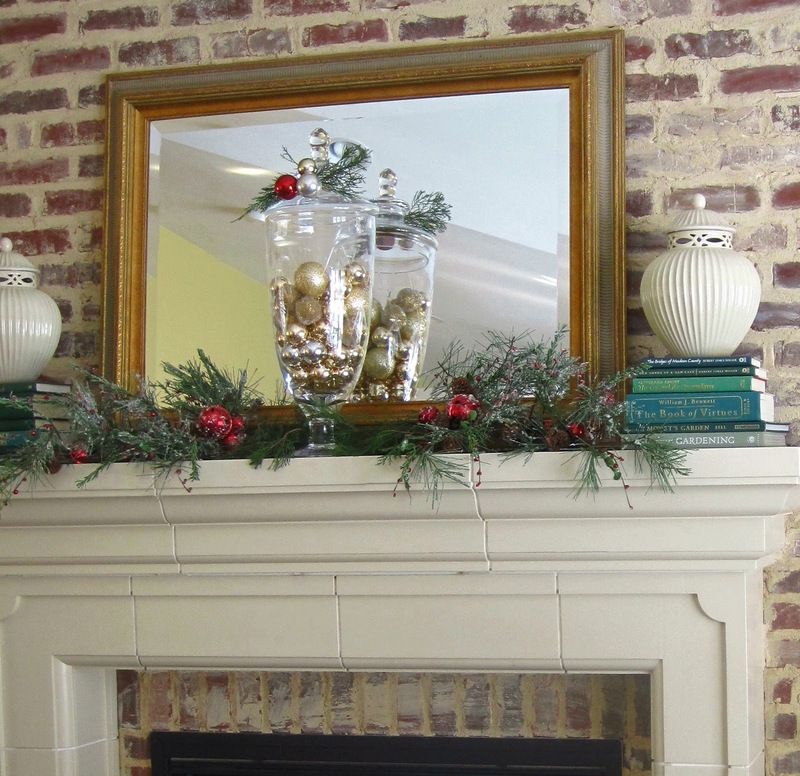 Your mantel just adds to the warm coziness of your house - love it! I guess you will want to warm up with that fireplace with the weather you have been having! Beautiful! Beautiful!So calm and serene. Apparently I am NOT detail oriented - it all looks lovely and festive to me! I can't find any mistake! Give up?? The glass jar was a beverage server, but the spigot broke, that piece on the left is an ugly hunk of plastic sticking out - I turned it to the back! looks gorgeous! love the stacked books. How gorgeous! That brick is so great - a great backdrop. 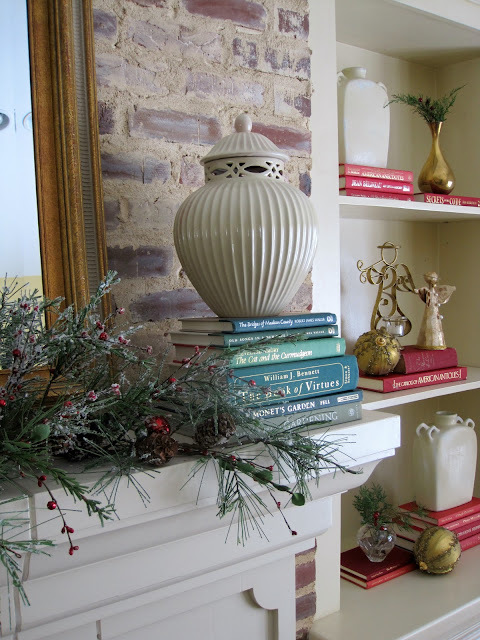 And I love the greens on the mantle. I think maybe one of the tops to the jars is slightly off? Maybe? I don't know. Can't wait to hear about the PAR-TAY! Very pretty, Pam! First of all, love that rustic brick. Also, the Christmas decor is beautiful! The red stacked books are great! Thanks for linking up.